My work is included in the following exhibition, curated by Rolf Hoff of the Kaviar Factory, at the Foundation Hippocrène in Paris, France. 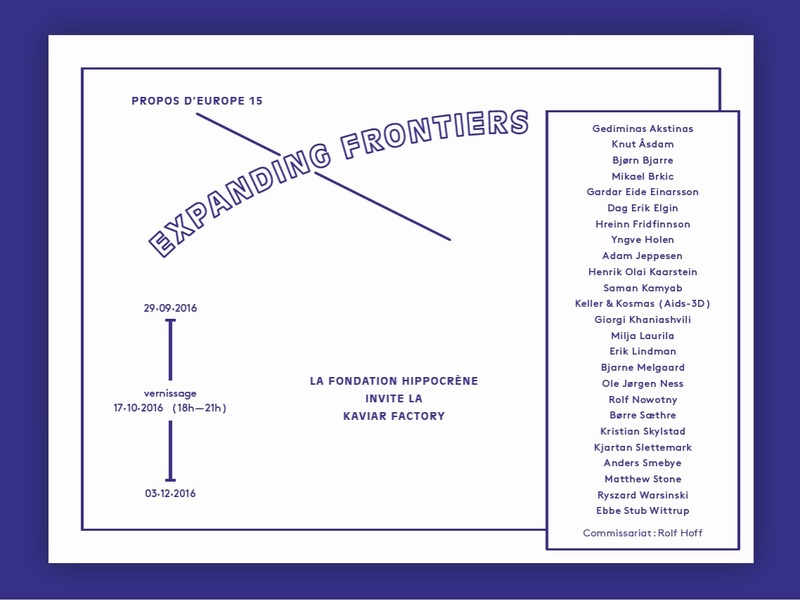 Pour la 15ème édition de Propos d’Europe, exposition annuelle d’art contemporain promouvant la rencontre et la création d’artistes européens émergents et confirmés, la Fondation Hippocrène invite cette année la KaviarFactory de Norvège, mettant ainsi à l’honneur la scène contemporaine nordique. L’ancienne agence de l’architecte moderniste Robert Mallet-Stevens accueillera, du 29 septembre au 3 décembre 2016, une partie de la collection de Rolf et Venke Hoff – grands collectionneurs norvégiens depuis trente ans, fondateurs du centre d’art situé dans les îles Lofoten – qui sera dévoilée aussi amplement pour la toute première fois à l’étranger. Intitulée Expanding Frontiers, l’exposition, dont le commissariat est assuré par Rolf Hoff, permettra de découvrir une trentaine d’oeuvres principalement conceptuelles et de tous médiums de 25 artistes contemporains internationaux, majoritairement norvégiens et scandinaves, pour la plupart peu connus en Europe et exposant parfois pour la première fois en France. Cette exposition marquera également la quatrième collaboration de la Fondation Hippocrène avec une fondation ou structure privée et européenne d’art contemporain. In Erik Lindman’s new works, the artist creates fresh abstract forms with a fine attunement to painterly details, constellated around various found surfaces and their treatment as compositional elements, surfaces, and supports. 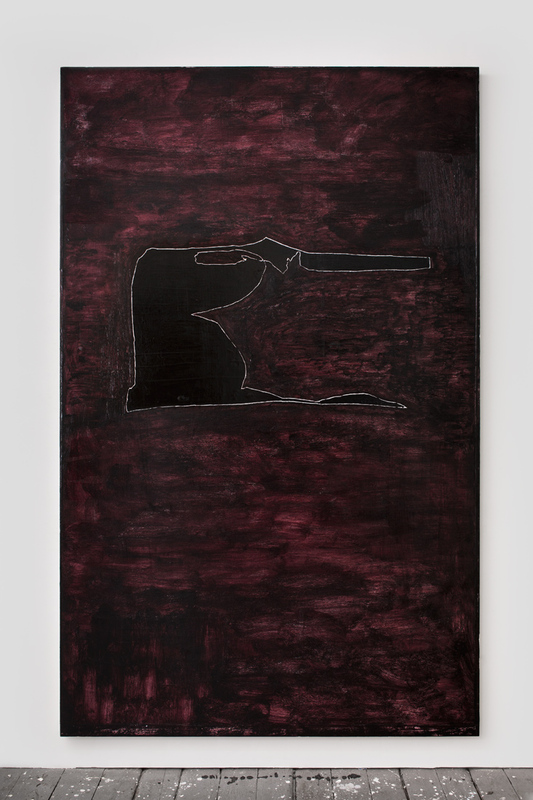 The majority of these new works are on primed or linen-wrapped panel that are affixed with thin sheets of aluminum or steel sheetmetal (or occasionally other flat, less-identifiable building materials), which are disguised and revealed to varying degrees by the application of paint on and around them. Colors and forms tend to accrete in the center of the painting, framed by white or unpainted space. 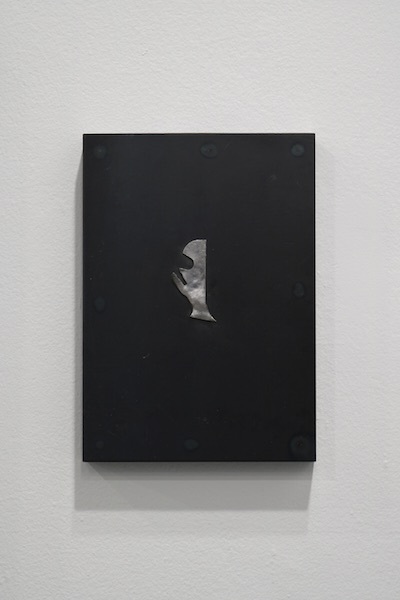 These found elements, which were picked up on regular walks by Lindman around the neighborhood of his studio in Harlem, Manhattan, are handled in a way that is characteristic of the artist’s cogitative approach, wherein material economy becomes an entry point to a particular type of seeing. To the extent that these compositions restrict form, color, and representation, they may elicit a subtle awareness through the shifts in perception that occur as a viewer’s focus wanders between the process of painting and its effects. 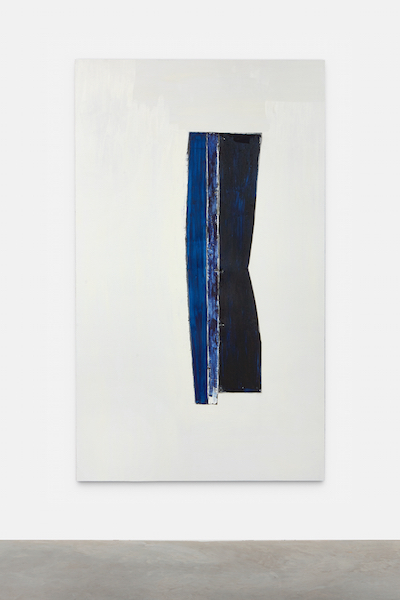 In his use of metal, Lindman attaches the found element to the support invisibly, then builds up paint around its edges, bringing it nearly level with the surrounding layers of paint so that it appears practically embedded in the painting’s surface. Almost flush with the ground of the paintings, these metal sectors receive paint in uneven ways and emit a faint, irrepressible sheen. 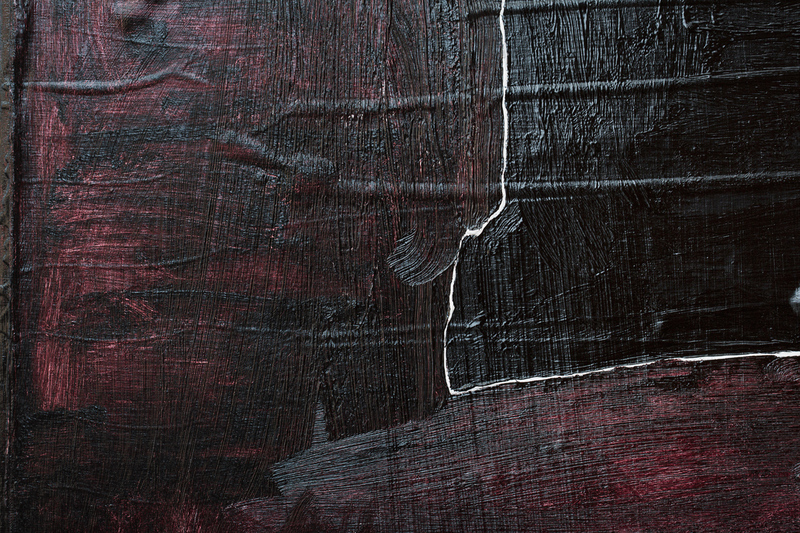 The complicated flatness of each composition becomes a stage to exhibit detailed wrinkles, scratches, and striations in the paint, margins where color and metal meet, and expanses of thin pigment stretched across scuffed reflective veneers. Scrutinizing this paint on metal, we might add the layer of our own optical, tactile, and spatial experience. The vertical shape and human height of the pieces, along with their recurring narrow central figures, offer an analog to the instinctive, somatic self lying deep in our bodies. Awareness is a feedback loop created somewhere between our faculties and the object, while the boundaries of a painting could provide a theoretical if not a literal kind of mirror. Lindman has also created several small works using fragments of steel welded to steel panels, occasionally adding oil paint. In these pieces, rather than inserting metal into a painting, the artist effectively creates the painting in metal; a stainless, enduring stand-in. But their modest scale diminishes any lingering bravado associated with their rugged materials and provides a counterpoint to the larger works on panel. Presence, an ambiguous noun attributable to both humans and objects, could also be the invisible stratum differentiating a painting from an image. Lindman creates frameworks for examining this liminal terrain through a sensitive range of micro-variegations. Transmitting exchanges between light shining forth from alloy, absorbed into painted color or blank primer, these works imagine an encounter with the irreducible. Image: Untitled (Blue Bells), 2015-2016 Found surfaces (sheetmetal) and oil on linen over panel. 78 x 46 inches. The show’s title refers to an Auguste Rodin sculpture in the collection of the Metropolitan Museum of Art, New York – The Walking Man (L’homme qui marche) – that Lindman has spent many hours contemplating. The artist’s attraction to the work is two-fold. On the one hand Lindman is drawn to the fact that the sculpture is a conglomerate of parts from three failed works. On the other, he is compelled by the work’s affectual impact: the sculpture is at once direct and bodily, but also anonymous and abstract, due to the frontal orientation of this striding headless and armless figure. An imagined form can arise from the basic geometry of the human body, which is not their referent, but rather their test. This is why in Lindman’s paintings we can relate these differently sized canvases to heads, upright figures, and, yes, torsos – even to non-human forms, as the painting “Horse” demonstrates. 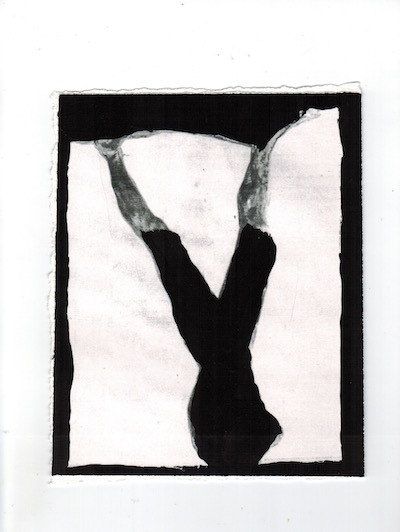 The show’s title, Torso, conveys this, as does the painting shown here of the same name. This is not to say that the painting “Torso” depicts this part of the human anatomy. Rather that the painting’s blocky central shape, and the roughly human dimensions of the canvas, make it so that the viewer cannot help but relate to the painting at the level of a frontal address, that blocky form echoing the viewer’s own musculature. This exhibition presents 130 publications that comprise the bibliography of critic and curator Bob Nickas, an essential figure in the New York art world of the past thirty years. He marks his 30th anniversary by emphasizing the importance of books, catalogs and publishing, of writing and documentation in an increasingly market-driven period. In commissioning a number of artist-designed posters for the show, he also reaffirms his love for printed matter, and for how ephemera allows ephemeral situations—exhibitions and events—to live on. For 30 / 130, posters by Anne Collier, Trisha Donnelly, Ryan Foerster, Wayne Gonzales, Louise Lawler, Amy O’Neill, Nikholis Planck and Dan Walsh will be exhibited in both unique and multiple copies, some made available as take-away or modestly priced prints. For Nickas, books and catalogs also represent a democratic aspect to art. In addition to inscribing history within the lived texture of the present, they are relatively affordable, an alternate means of collecting art that deals with its meaning and its contextualization rather than its object status. Books and catalogs can circulate much more freely than works of art, allowing for the ideas within to be shared and distributed to a far greater extent. But Nickas is also himself a collector, and the show will incorporate art acquired over thirty years, whether as gifts, in trade or purchase. There will also be a number of works made especially for the occasion, including an installation by Lisa Beck, a wall painting by Gardar Eide Einarsson, and a mannequin sculpture by John Miller. The publications in this show represent books written by Nickas, catalogs from the numerous exhibitions he’s organized since 1984, catalogs and artist monographs to which he has made significant contributions, and self-published ‘zines created in limited edition. Long involved with music, he will be showing albums released on his label, From The Nursery, including a new record produced to accompany a series by artist Kelley Walker, with cover artwork by Walker. The exhibition will include a 1989 edition of prints made collaboratively with Olivier Mosset, originally shown at Pat Hearn Gallery, and not seen in more than twenty-five years. Covers and page spreads from Index magazine, published by artist Peter Halley, and edited by Nickas between 1996 and 2000, will also be on view. Found steel welded to mild steel panel, paste wax. Almine Rech Gallery is pleased to announce Blanks, the third exhibition by American artist Erik Lindman at the gallery- the artist’s second in its Paris space – from March 21 to April 22, 2015. The exhibition will be comprised of entirely new paintings. “Over the past few years, I have been using found surfaces in my paintings. The found surfaces incorporated an objective correlative into the painting: a pre-made element from which to begin. In the studio, I would edit these surfaces through reshaping and orienting them on the canvas. It was important to me that the added surfaces not have a physical dimension. I would integrate them into the picture plane through building up paint layers to the level of the found surfaces on the supporting canvas. Through this process, the marks and the shape of the found surface would read visually integrated, not dimensionally separate. My interest in these elements was always painterly, not in the specificity of the surfaces. Painting over the found surfaces, their shapes and lines became guiding principles. The incidental marks on the surface brought forth in previous works were no longer present. Painting over the surfaces obscured their source and created a highly specific shape that exists only in the painting itself. The obscured surfaces made the resulting work directly engage with a language of painting instead of an appropriation of its vocabulary. Embracing this language allowed for a freedom to create new paintings from proxies of the found surfaces. In this new body of work, I have traced the found surfaces directly onto paintings, transforming them into drawing elements. I have traced the found surfaces onto sized canvas that I have collaged onto new paintings. I have collaged multiple versions of the same form onto the same canvas. I had previously described the surfaces as anonymous, but now a better word is eidetic.